We’ll spend the day exploring the world of the 18th century medical profession in Philadelphia. 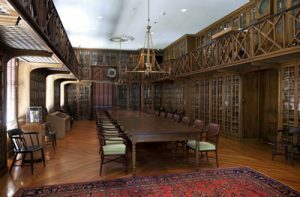 We’ll start with a guided tour of the 1804 Pine Building of the Pennsylvania Hospital, visiting its historic library to see the collection of medical and scientific texts. Then we’ll climb the stairs to the third floor operating room where we’ll see the amphitheater seats that provided observers a good view of the table where Dr. Phillip Syng Physick, considered the father of American surgery, performed operations on non-anesthetized patients on bright, sunny days. We’ll walk a few blocks to visit Dr. Physick’s home. Built in 1786, it is the only free-standing Federal townhouse remaining in Society Hill. Then we’ll walk another few blocks to City Tavern, which the doctor no doubt frequented, for our own 18th century American lunch. Our final stop will be a guided tour of the Mütter Museum, America’s finest museum of medical history. We’ll see beautifully preserved collections of anatomical specimens, models and medical instruments. Our tour guide will help us understand the mysteries and the beauty of the human body so we can truly appreciate the rich history of the diagnoses and treatments of disease. PLEASE NOTE: The only way to view the amphitheater in the Pennsylvania Hospital and the upstairs of the Physick House is to climb a flight of stairs. Cost includes transportation by school bus, entrance fees, lunch, snacks and gratuities. 7:45 a.m. to approximately 5:30 p.m. Bus leaves Cheltenham High School promptly at 7:45 a.m.